As a business owner, you need an overhead commercial door that’s tough, reliable and affordable. You might also want it to be energy-efficient, fire-resistant or eye-catching. But there’s no need to settle for either/or. When you turn to Door Pros, you can have it all. At Door Pros, we’re the leading overhead garage door company in the Coachella Valley towns of La Quinta, Palm Desert, Rancho Mirage and Indian Wells. That’s because, when it comes to the sales, service and installation of commercial overhead doors, we have your every need under lock and key. Plus, we offer Clopay—the most durable, secure and energy-efficient brand for commercial garage doors, glass commercial doors, commercial entry doors, commercial storefront doors and more. When it comes to providing our customers with a long-lasting, easy-to-operate, quality commercial overhead door at a fair price, we mean business. Plus, we offer a wide range of sizes and designs. So, when you come knocking, you’ll find doors that meet your business’s needs. 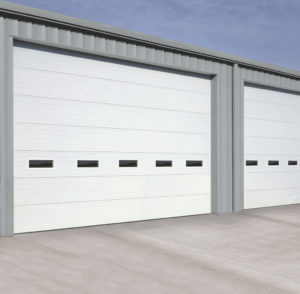 If you’re looking for dependable operation, energy efficiency and a sleek design, our commercial sectional doors could be the perfect fit. Your options include glass commercial doors, industrial steel doors and steel overhead doors. Glass commercial doors deliver the open visibility, natural light and modern, industrial design that restaurants, retail establishments, service stations, car dealerships, fire stations and similar businesses require. From maximizing daylight views to delivering a distinct architectural appeal, our glass commercial doors can be used as an exterior garage door, interior partition, versatile patio door to merge indoor and outdoor spaces and so much more. 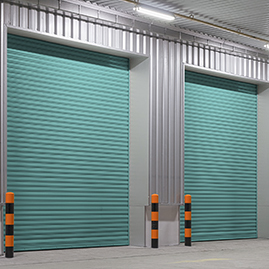 Industrial steel doors are perfect for businesses that require a commercial overhead door for high-traffic applications, including warehouses, distribution centers and loading docks. These doors not only provide pro-grade durability, but they’re offered in a variety of standard ribbed, flush and embossed patterns such as stucco and wood grain, too. If your business provides automotive service, then an industrial steel door should be in your game plan. 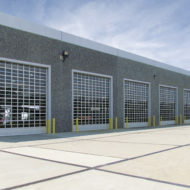 Steel overhead doors provide superior temperature control, energy efficiency and long-lasting service. 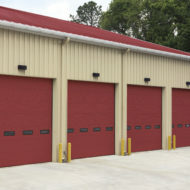 This commercial garage door is the ideal choice for commercial spaces—including firehouses, warehouses, and municipal buildings—where climate control, reliability and durability aren’t an option. They’re a necessity. Coiling steel counter doors and shutters are ideal for parts departments, concession areas, cafeterias, pharmacies, cashiers, parts and tool storage areas. Coiling steel and aluminum security grilles provide security while allowing full visual access and air circulation. These rolling steel doors are ideal for shopping malls, convention centers, schools, garages and other institutional, commercial and retail spaces. Roll-up sheet doors are ideal for warehouses and mini-storage facilities. These doors are available with insulation and also feature fire- and smoke-rated models, with material options including steel and aluminum. They’re also available in 20 different standard color choices. If you’re a business owner who wants to improve your space’s visual appeal, reduce energy costs and find overhead commercial doors that will last for years, our overhead garage door company is here to help. We offer the most dependable doors in the industry and provide flawless garage door installations of commercial sectional, rolling steel, rolling sheet, fire doors and more. Plus, if your door gets off track, it’s no sweat with our swift garage door repair services. We know how important it is to return to business as usual when your day-to-day operations and security are compromised. Because of this, we offer same-day garage door replacements and emergency garage door repairs. When you partner with us, peace of mind is just a phone call away. 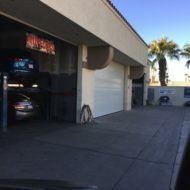 Door Pros is the complete overhead commercial garage door company that business owners can rely on in Sacramento, La Quinta, Palm Desert, Rancho Mirage, Indian Wells and throughout our coverage area. Call us today at 760.993.6873 or contact us on the web to see how we can help you open your business’s door to smoother operation. 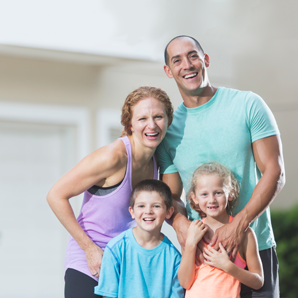 Speaking of smooth, we offer superior door services that homeowners need, too, including swift sliding door repairs, garage door opener installations and more! To schedule an appointment, give us a ring at 760.993.6873!